Depending of your age, you may remember that 6-speed, 5-speed, or 4-speed automatic transmissions were a breakthrough. 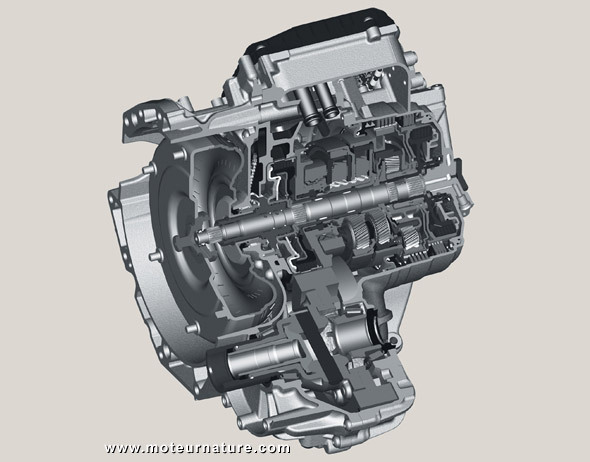 If you’re really old, you may remember the GM Powerglide transmission which was a two-speed unit. Low and high, that was more than 50 years ago. Today, Audi, BMW, Lexus and Rolls Royce sell cars with an 8-speed automatic transmission. Hyundai has just introduced one, Ford and Chrysler will follow soon, with more to come as German manufacturer ZF introduces the first commercially available 9-speed transmission. This should translates into fuel saving gains up to 16%, and possibly even more as this transmission can readily accept a Stop & Start set-up, or even turn itself into an hybrid system after the replacement of the torque converter with an electric motor. A supplier to the auto industry, ZF can sell this transmission to any car manufacturer worldwide. Transmission controls, shifting points and shifting dynamics can be fully tailored to the customer’s requirements. We just have to wonder who will be the first to buy the new transmission. My guess is that the first will gain a strong marketing advantage, so he will have to be fast… I bet on Chrysler or Peugeot.